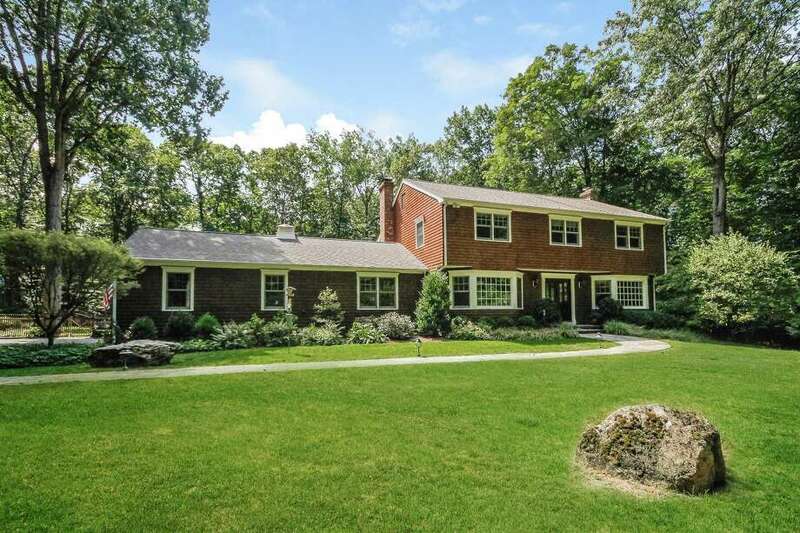 The cedar-colored classic colonial house at 19 Cavalry Hill Road sits on a level property of 2.15 acres. WILTON — A private piece of paradise exists at 19 Cavalry Hill Road in lower Wilton. The 2.15-acre level, park-like property and its nine-room cedar-colored classic colonial house doubles as a comfortable home and a recreational play space inside and out. Inside, there is a first floor recreation room with a nine-foot Brunswick regulation pool table and wet bar. Augmenting the entertaining value is the 1,000-bottle wine cellar in the full, partially finished basement. Outside, there is a heated, free-form Gunite in-ground swimming pool and spa, a large stone patio, and a two-tiered Ipe wood deck, all of which is set into the attractive professional landscaping of the fenced backyard. The comfortable home includes nine rooms and 4,003 square feet of living space. This pristine home is move-in ready. It was built in 1969 although it more recently experienced an extensive remodeling. Its updates have made it like-new. Its many features include Nest thermostats, a Lutron lighting system, Sonos sound system inside and outside, Marvin windows, new siding, extra insulation, and updated baths. Not far from this property there is one of the town’s natural assets - the 21-acre Stonebridge Waterfowl Preserve, which features a nearly one-mile walking trail on the west branch of the Saugatuck River. This protected sanctuary, which is managed by the Aspetuck Land Trust, provides trout fishing, hiking, dog-walking, and in the winter cross country skiing. Enter the Belgium block-lined driveway to this house by passing through the stone pillars topped with lanterns and travel to the ample parking area. Follow the natural granite path to the French doors of the front entrance. The doors, with decorative leaded glass panes, open into the foyer. From there the spacious formal living room is to the right. It features a marble fireplace. This room and the formal dining room on the opposite side of the foyer both have bay/bow windows. In the family room there is a floor-to-ceiling stone fireplace with a raised hearth, wall-to-wall carpeting, and built-in cabinets and shelves. Hidden behind one cabinet’s doors is a dry bar area with storage for beverages and stemware. Sliding doors lead to the deck, pool, and yard. The chef’s kitchen features a wide peninsular counter that doubles as a breakfast bar, granite counters, a double stainless sink, a skylight, a large eat-in area, and high-end appliances including a Viking Designer refrigerator and Electrolux range. A long hallway off the kitchen accesses the attached two-car garage and the large recreation room. It has a ceramic tile floor and sliding doors to the deck. Along one wall is a long granite counter with the wet bar, a wine cooler, refrigerator, and ice machine, cabinets and drawers. A full bath in this hallway can serve as a cabana for the pool. On the second floor there are four bedrooms. The master suite has a ceiling fan, wall-to-wall carpeting, walk-in closet, and a spa-like bath with a double marble vanity and large shower. The other bedrooms share a hall bath. In the basement there is another 754 square feet of living space not included in overall square footage of the house. In addition to the wine cellar the basement has a sitting or play room, exercise area, a workshop, and ample storage. For more information or to set up an appointment to see the house contact Judy Robinson of Realty Seven Inc. at 203-451-0480 or robinson@realtyseven.com.